Removes lint and pet hair from clothes, sheet and towels as they dry. 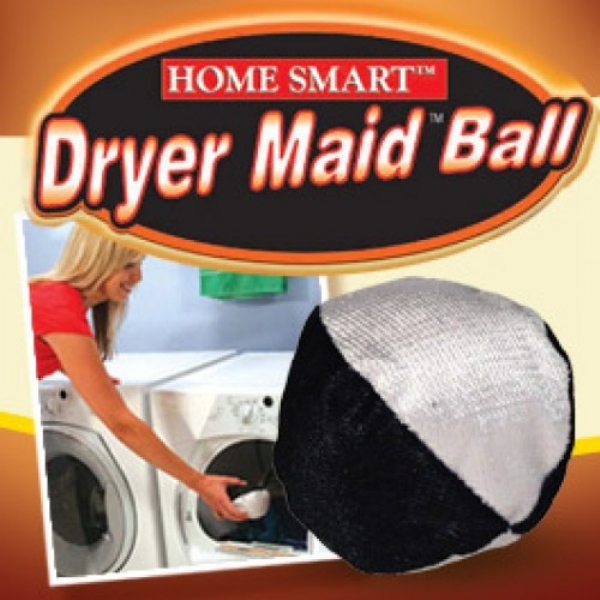 Dryer Maid Ball removes lint and pet hair from clothes, sheet and towels as they tumble in dryer and sends it to the lint trap for easy disposal! Cat hair, dog hair, lint gone. Dryer Maid Ball, as seen on TV, works like thousands of tiny lint brushes in every load, plus its electrostatic technology attracts hair, lint. As the Dryer Maid ball spins, it brushes fabric and absorbs static electricity that attracts hair and lint and releases it in the lint trap. Dryer Maid separates clothes so they dry faster. Reduces wrinkles and static buildup, no need for costly dryer sheets and it is chemical free. Reusable. Removing pet hair and lint has never been so easy. The lint removers work and I keep them in my dryer. They actually remove lint and fuzz, and do not make noise as they flop around in the dryer. It&apos;s a useful novelty gift. No dryer should be without one, or two. I use this on my dark clothes to get the cat hair off in the dryer. It makes a world of a difference. I recommend throwing your clothes in the dryer for about a 1/2 hour before washing them to get the hair off. I bought another one of these previously and it&apos;s lasted almost a year. The balloon inside has shrunk so it&apos;s time for a new one. I leave the dryer maid ball in the dryer and it grabs most of the cat hairs and strings from my clothes. These dryer balls are the greatest...I should know having 8 cats all indoor...Lots of cat hair on everything. I put these in my dryer with all my laundry and can really see the difference on the screen filter when using them. I even did towels once without them in and than put them in for 2nd round and could not believe how much hair was on the filter..... Thank you these are the greatest. This works to take lint and cat hair off of our clothes and is really appreciated. Haven&apos;t found anything wrong with it so it&apos;s all good. I was amazed at how well it separated the cat hair from the clothing and bed linen, and deposited it in the dryer lint collection trap. I have a long haired cat, and now I have an advocate sitting in my dryer waiting to fight the battle.....I would highly recommend this item. Thereis nothing else like the this laundry maid, it works even better with dryer sheets. This is absolutly the best lint and pet hair remover ball I have ever used. My clothes come out like new! I had one but my three dogs got ahold of it and chewed it up. I had forgotten the name on the ball. Needless to say I purchased several dryer balls before I came back across the Dryer Maid. This is the one, the others should be taken off the market! It is AMAZING at how it gets rid of pet hair and that left over kleenex pieces left it a pocket. It does the greatest job. I LOVE it and have been looking and looking in stores for another one so I could give my daughter. I just now thought of checking the internet. YEA!! Of all the gadgets you see on TV that don&apos;t work like they say, THIS ONE DOES!